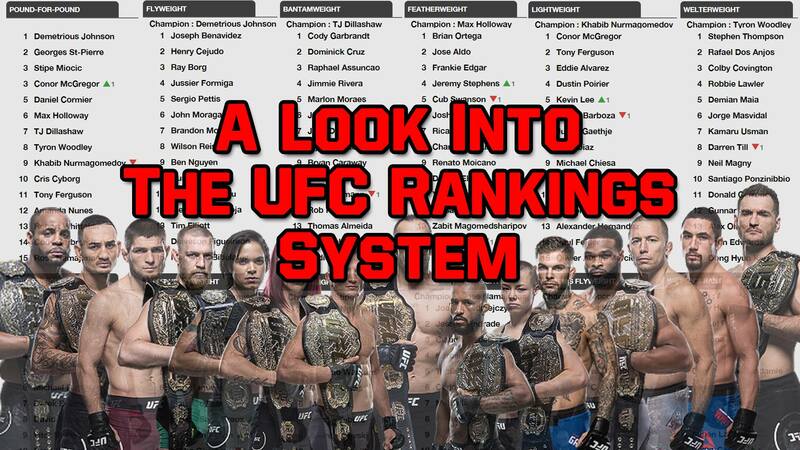 A Look Into The UFC Rankings System - Who is doing the voting? Recently the UFC pound for pound rankings saw a shift that had many people scratching their heads. 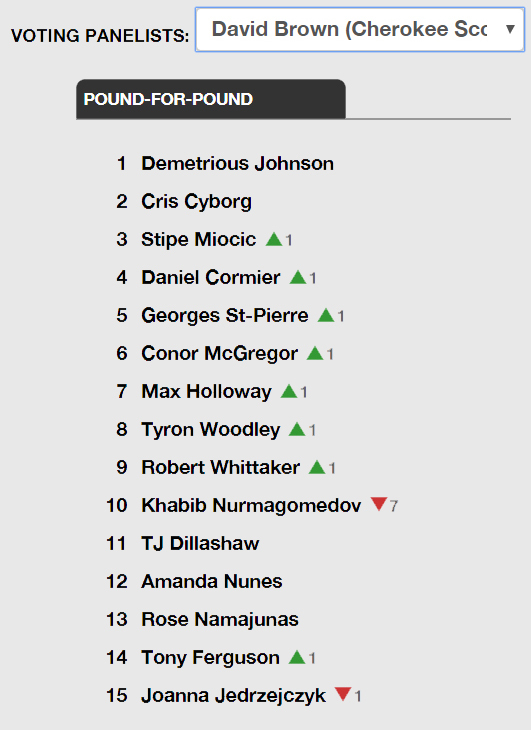 After UFC 223, an event where Khabib Nurmagomedov won the recently vacated light weight title, Khabib moved down in the UFC rankings. 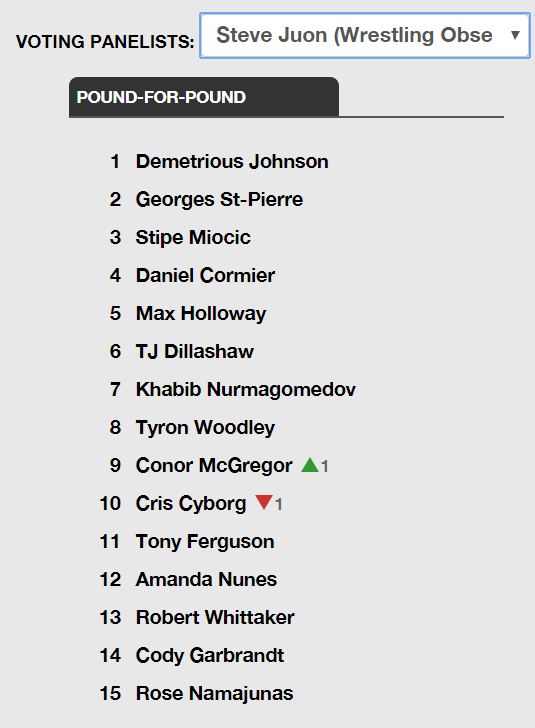 Strangely, Conor McGregor, who has not fought in the octagon since November of 2016, moved up a slot to number 3. How did this happen you might be asking? Well, two voting members of the official UFC ranking pool made that change. Specifically, members Steve Juon and David Brown. These two saw fit that Conor, despite his inactivity, unless you count throwing a moving dolly at a bus full of fighters should move up in the rankings. I guess if you injure two fighters at the same time in a criminal act, in their minds, it should count for something. They also didn’t seem impressed with Khabib’s five round dominate win over Al Iaquinta, to capture Conor’s stripped belt, so he should move down a notch. Now you might be asking yourself how do two voters sway the entire ranking system? How do the UFC rankings work and who are the privileged few who get to vote? It should be noted at any given time the UFC may remove a fighter from the rankings or eligibility to be voted due to numerous things such as, contract negotiations, discipline, or seemly on a whim. They have done this before with Nate Diaz and Cub Swanson just to name a few. 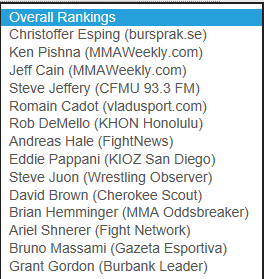 So who are the media members chosen to vote for the UFC rankings? Well there are 14 members. Grant Gordon: Representing the Burbank Leader. He also is a sports writer for the LA Times. Bruno Massimi: Writer of the Gazeta Esportiva, a Brazilian sports website. Brian Hemminger: Reporting for MMA Oddsbreaker. The site is one of the leading odds makers for MMA betting. Brian is also the podcast host of The Verbal Submission and former staff writer at MMA Mania. David Brown: Reporting for the Cherokee Scout. The Cherokee Scout is a local newspaper for Murphy, NC. Mr. Brown is listed as the Administrator on the company website. Steve Juon: Listed as a reporter for the Wrestling Observer. While not listed on the official Wrestling Observer website as staff, he has contributed to many stories for them. His currently listed as a staff member of MMA Oddsbreaker, as well as a staff writer and editor for MMA Mania, and being most known for his own pro wrestling based website Angry Marks. Eddie Pappani: KIOZ 105.3 San Diego. Eddie is a morning radio personality for KIOZ under the iHeart Media umbrella and longtime MMA fan who covers the sport on his show. Andreas Hale: Listed as representing Fight News. 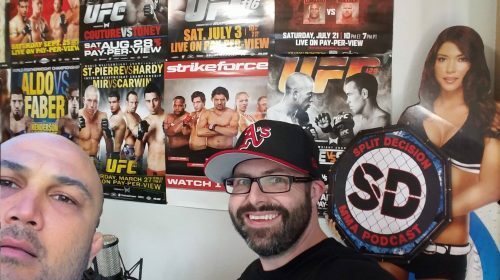 While not listed on the Fight News, a primarily boxing based website as a staff member, Hale is listed as a freelance writer contributing occasionally for Sherdog, Boxing Scene, as well as being a podcast co-host of the boxing, mma, and pro wrestling based show, “The Corner”. He is also editor of hip hop based website, 2dopeboyz.com. Rob DeMello: Representing KHON Honolulu. Rob is a sports reporter for Honolulu, HI local tv station KHON Channel 2, which itself is a CW affiliate. Romain Cadot of vladusport.com: A French sports website. Steve Jefferey of CFMU 93.3 FM: Steve is the co-host of “The Hammer MMA” a podcast and radio show for the local campus/community radio station from Ontario. He is also a contributor to mmasucka.com. Jeff Cain: Representing MMA Weekly. He is a senior writer of the popular site and radio co-host. Ken Pishna: Also representing MMA Weekly. He is the managing editor of said popular MMA site. Christoffer Esping, bursprake.se: A former Swedish website that seemingly doesn’t exist anymore. Mr. Esping occasionally also wrote for mmanytt.com, another European MMA website. Seeing as the voting pool is so small, any small adjustment sends the rankings moving to large degrees, as with this past week where 2 members made changes and others did not. We reached out to a few major MMA journalists who are not on this list as to why they don’t participate and add more depth to the pool. We were told that some work for companies that have policies that do not allow them to participate due to how the UFC uses the rankings, to build fights, create pay structures and other financial reasons. Others opt out due to the lack of transparency by the part of the UFC when using the rankings, ie pulling fighters off when negotiating contracts or for discipline. While we understand that UFC rankings are a matter of opinion and not everyone will always agree, the UFC rankings do have an impact on fighter’s lives. The UFC uses these rankings for matchmaking as well as contract negotiations. We believe there are some voters listed above that are more qualified than others. Right now the only qualification is that voters are required to vote within 48 hours of an event or be pulled. Some of the voters no longer represent the outlets they originally claim or are even with the MMA media. Some voters have written pieces justifying their decisions, or engage in discussion over choices with others on public forums such as Twitter, others when questioned resort blocking you on social media and continue to vote bizarrely, favoring fighters of their home country, or blindly moving a fighter up in rankings while having zero fights in the last year and a half. As a fan of the sport, I believe the UFC should probably review the process, which I am glad to report is something I’m told the UFC is internally in the process of doing. So the next time you look at the rankings and wonder, “What is going on here? !”, reach out to the voters and keep them honest. Part time MMA podcast host of Split Decision. Part time bartender. Part time burger blogger. Full time MMA fan.